In today’s post, I am sharing one of my families most beloved fruit trees – the plout. You will learn what this tree is and why I think every home garden should have at least 1 of these trees. My husband and I both fell in love with the unique color and the flavor of the pluot fruit after having one at a local farmers market back in 2004. Of course, my husband found one online to order and add to our home garden immediately being new to growing an orchard. I am so glad he did because it is a tree we almost always get a harvest from. The fruit is always tasty and sweet. Oddly the deer seem to leave this tree alone – maybe because by the time this produces I early to mid-summer there is so much more in the woods for them to eat! This video can be found on my YouTube page at Bren Haas. The best way to describe this tree and fruit is WOW!!!! Pluots are suggested for planting in USDA Plant Hardiness Zones 5-9 because they are known performers. Both the trees we grow in our Northwest Ohio garden have a distinct flavor that is sweet and juicy. It is the best of apricots and plums mix. The advantages of being a good pollenizer for most of the other Pluot® varieties; for this alone, it’s a very important variable. Dapple Dandy is also proven to set in zone 5-9. We’ve experienced a crop setback one year, and oversee the following season, perhaps leading to alternate-year cropping. The solution is to aggressively thin Dapple Dandy tree each year according to David Willson Nursery. This fruit literally explodes in your mouth with amazing sweet as honey flavor and crunch. The fruit also hangs on to the tree – so you don’t have to pick it immediately. I’ve heard of home growers being able to harvest this fruit all the way into October. This is from the first harvest off one tree! What do do with the harvest? I’ve yet to make jam from my harvest but I do dehydrate them like a plum to use later in the year. I also give many away for folks to enjoy during harvest. I would love to hear your opinion about the pluot tree. 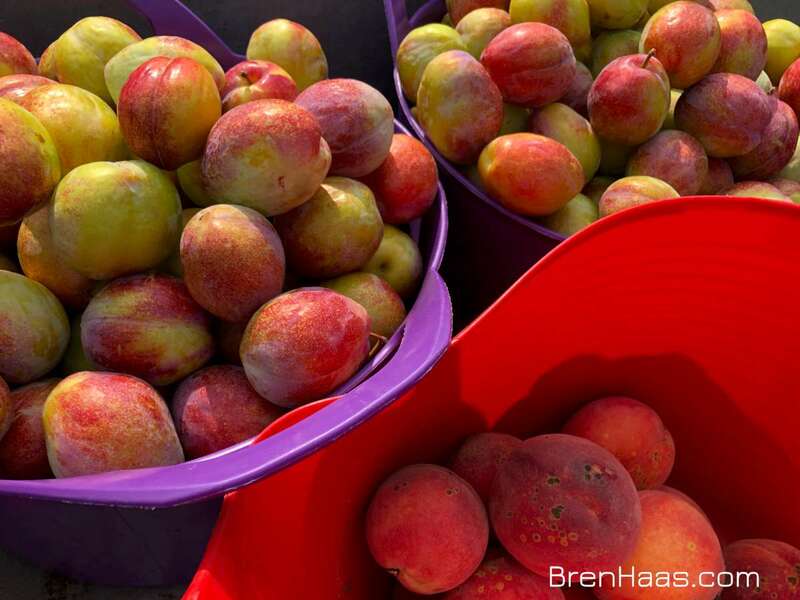 Have you tasted a pluot before? Comment on this blog post or leave a message on my contact page. They’re so yummy! Can’t wait for more. I can’t wait to share more… we’ll have to try making jam out of them next time. Thanks for stopping by Suellen. I never heard of a pluot before until Bren brought some to my home. They were wonderful, sweet and juicy! I took some to my office as well, and everyone loved them. Thanks Bren for sharing.